The other day I was given a large bag of very ripe bartlett pears. For a long time I didn't like pears. Mostly because of the pears we got with snack or lunch in elementary school. I have since discovered that not all pears are hard or mealy. This bag of pears was especially good and very ripe. I ate most of them just by themselves, but as they began to get over-ripe I had to find something to make that would use up my remaining stock. I searched my favorite internet sites for recipes featuring pears. My criteria was that the recipe could only call for ingredients I had on hand. 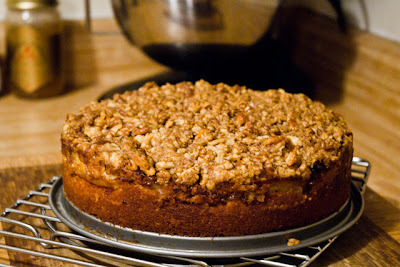 I settled on this recipe for Walnut Pear Coffee Cake. This was my first attempt at baking a cake from scratch and I think the results were spectacular. The one change I made to the original recipe was made out of necessity. I substituted the cup of sour cream in the original recipe with 1 cup plus 1 tablespoon of plain non-fat yogurt. This recipe has made it in to my little black book of recipes calling for the substitution ingredient rather than the original. In a small bowl combine 1 cup of walnuts, brown sugar, and cinnamon. In a separate bowl add the flour. Flour your fingers and work the butter into the flour until it becomes a course texture like little pebbles. Most of the flour should be in little clumps. Combine 3/4 cups of the walnut mixture with the flour and butter add the remaining 1/2 cup of walnuts. The remaining nut mixture from above is part of the filling (the mixture without the flour and butter). Toss the pears in the lemon juice. Cream together the 1/2 cup butter and sugar using a stand mixture and the paddle attachment. Add 1 egg at a time and mix until incorporated. Mix in the vanilla and almond extract. Mix 1/3 of the flour with the butter and sugar mixture. Alternate with 1/3 of the yoghourt until all of the flour and yoghourt and butter has been combined. Use as little mixing as possible to combine the ingredients. Pour 1/2 of the cake batter into a greased (with butter) 9 inch spring form pan. Sprinkle with the nut filling (the stuff without butter). Lay the pear slices in an even layer on top of the nut mixture. 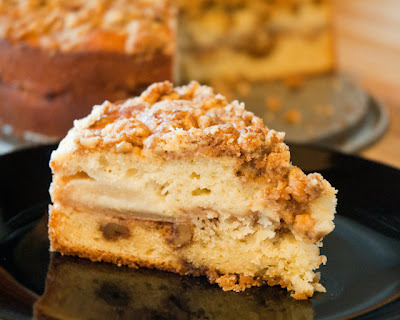 Pour the remaining cake batter over the pears and spread the crumble topping evenly over the top. Bake in a 350º F oven for 50 - 60 minutes. When a toothpick is inserted into the middle of the cake it should come out clean. Remove from the oven and cool the cake on a cooling rack for 10 minutes. Run a knife around the sides of the pan and release the spring form and allow the cake to cool for 1 hour. The batter was much thicker than I expected, yet the cake turned out light. The cake rose much more than I expected, so be careful if you use a shallow pan. I actually feel that the cake was best after sitting out for 12 hours. I don't feel like the sour cream would have made this cake much better, so I have elected to reduce the calories and fat in this excellent coffee cake recipe.